LIQUI-MOLY Bathurst 12 Hour regular teams and drivers will play a big role in deciding the Spa 24 Hour at the classic Belgian circuit this weekend. 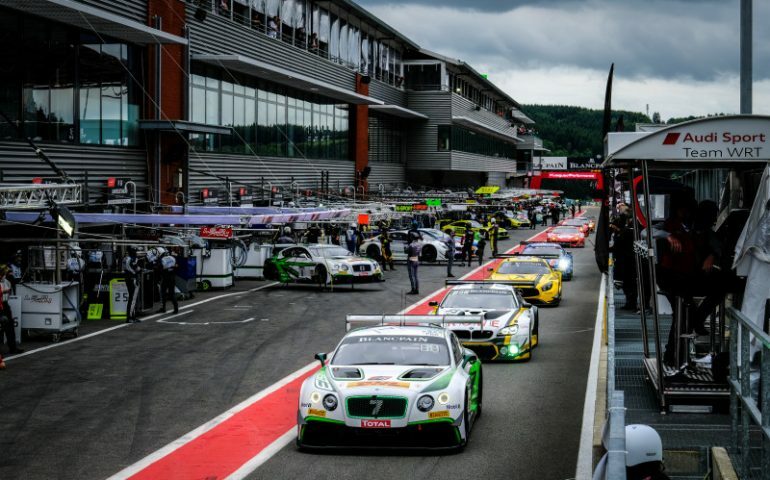 A host of current and former 12-hour winners are amongst the bumper Spa grid this weekend, the largest all-GT3 grid in the sport. Double 12-hour winner Chris Mies teams with Connod DePhillippe and Frederic Vervisch in the No. 2 Audi Team WRT entry, one of several cars from the team considered realistic chances. Bentley Team M-Sport take two cars into battle, each with a trio of Bathurst battle-hardened drivers. The No. 7 car includes Guy Smith, Oliver Jarvis and Steven Kane, while Car 8 includes Maxime Soulet, Vincent Abril and Andy Souceck. The car 7 crew finished on the podium at Bathurst last year in yet another stirring performance from the big British GT. 2012 winner Christer Jons is also in a Bentley – with Team ABT – while B12hr starter Stephane Ortelli joins the unique Emil Frey Jaguar program. Toni Vilander, who paired with Craig Lowndes and Jamie Whincup to win this year’s race, will jump back behind the wheel of a Ferrari 488 GT3 for AF corse, driving with Alex Demerdjian, Nicolas Minassian and Davide Rizzo. Aussie eyes will be focussed on Nissan NISMO GT Academy graduate Matt Simmons, who rejoins the Motul Team RJN Nissan squad this weekend. His teammates in the sister car include the Bathurst 12 hour hero and former winner Katsumasa Chiyo plus Alex Buncombe and Lucas Ordonez. Renger van der Zande, Christopher Haase, Markus Winkelhock, Nico Menzel, Michele Rugulo, former runner-up Matt Griffin, Marco Cioci, Rob Bell, Andrew Watson, 2014 runner-up Maxi Buhk and Kevin Estre are amongst the other international stars on the Spa grid to have tackled the Mountain as well. The Spa 24 Hour doubles as the second round of the Intercontinental GT Challenge, of which Bathurst was the season opener. Meanwhile, A huge number of enthusiastic fans attended the traditional Total 24 Hours of Spa Parade, lining both the public roads that link the circuit to Spa and the town centre itself. The drivers of the 63 cars participating in the highlight of the Blancpain GT Series and Intercontinental GT Challenge showed their gratitude by signing thousands of autographs in front of the Spa Casino. After the Bronze Test on Tuesday, the Total 24 Hours of Spa activities continued Thursday afternoon with the traditional parade. All 63 cars entered in the endurance classic, together with some of those competing in its support races, took to the public roads en route to Spa, greeted by the cheers of the thousands of fans lining the roads. Aston Martin, Audi, Bentley, BMW, Ferrari, Jaguar, Lamborghini, McLaren, Mercedes, Nissan, Porsche – prestigious brands one and all – were represented in the parade. The many fans were able to get up close and personal with the GT3 cars and drivers they will support from the sidelines over the coming days. Check out the Blancpain GT series website for more information about the race this weekend.